This is embarassing. The sheer scale of natural history collections means that some objects are going to be wrongly identified, and the fact that generations of professionals have worked here over nearly two centuries means that there has been plenty of opportunity to get things wrong. I am embarrased because I utterly failed to spot that someone had attached the head of one animal onto the body of another. I am particularly embarassed because both animals involved fall within my particular area of zoological interest – Australian mammals. Allow me to introduce you to…. At least, you’ve met its body. In 2015, fresh back from fieldwork involving the critically endangered woylies – an utterly charming tiny relative of the kangaroo – I decided to write a Specimen of the Week post about the species. I knew that a skeleton labelled “woylie” was on display, so I picked that to illustrate it. The mistake I made was not to look at it with a critical eye: I trusted the label and just popped the picture of it into my blog post. I should have known better. a) Its skull is big compared to its body. b) Its tail is waaaaaaaaaay too short for a woylie (as you can see from the model in the picture above). c) Its body doesn’t look anything like a kangaroo-relative – the legs are too dainty, the arms too butch. At least, its body was. Bandicoots are another group of Australian marsupials. 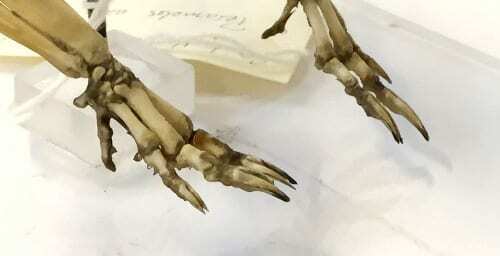 They have very distinctive finger and toe bones – the final phalange on each digit is divided almost in two. 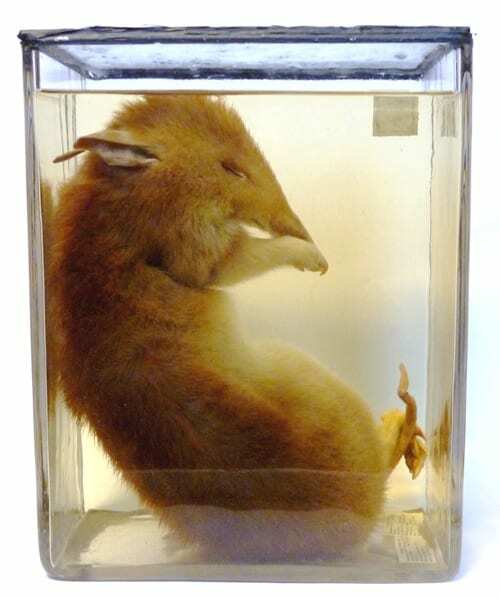 Beyond that detail, all the proportions of this specimen’s body scream bandicoot. The skull, on the other hand, is in fact a woylie. Consulting the museum’s specimen register, the entry for the woylie (numbered Z58) had originally said “skull and mandible”, which had been crossed out to say “mounted skeleton”. Hmmm… Suspicious. 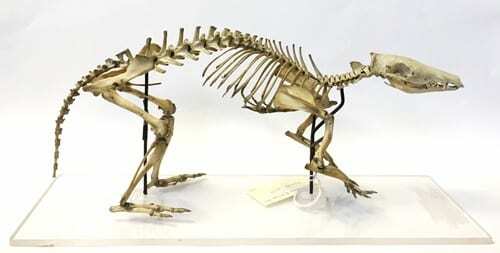 What had happened is that at somepoint in the specimen’s history, someone had added the woylie skull to the bandicoot skeleton, failing to notice the mismatch in colour, size and shape (the back of a mammal skull fits very nicely into the first neck vertebra – this pairing didn’t), not to mention anatomy. 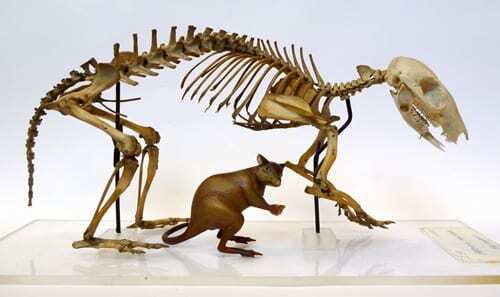 So having restored Z58 to its true museological existence as a bodiless woylie, we now had a headless bandicoot problem. After I had identified the skeleton, our curator Tannis Davidson went through all the bandicoot skulls in the collection to try and find its rightful owner. We both knew that it was entirely possible that the bandicoot’s original skull had been lost (otherwise why had our predecessors given it such a poor match? ), but it was worth looking. Low and behold, Tannis found a skull which was the same colour, correct size and even had drill holes where wire had once tied it to the skeleton, matching exactly the position of corresponding drill holes on the first vertebra. Not only that, but the skull was numbered Z85 (the woylie was Z58 – it’s pretty obvious what happened). The original catalogue entry for Z85 said “skeleton” crossed out, and then “skull and mandible” written in. The two histories were corresponding, and we recapitated the bandicoot. The message here is not to trust anything you see written on museum specimens – we all get things wrong and museum folk are no different. Jack Ashby is Manager of the Grant Museum of Zoology.